The scene depicted as of 3 a.m. local time on July 20 from Toronto. Other locations will have different views. If you live anywhere in the eastern half of North America and clear skies are forecast for early on Thursday morning, July 20, then be sure to be outside sometime between midnight and dawn and look for the thin crescent Moon hanging low in the east-northeast sky. Just about 5-days shy of New phase and 24 percent illuminated, it will again be crossing in front the Pleiades Star Cluster, making for a very beautiful scene in steadily held binoculars or a small telescope. In many ways, this event will be rather similar to an occultation that occurred back on April 1. 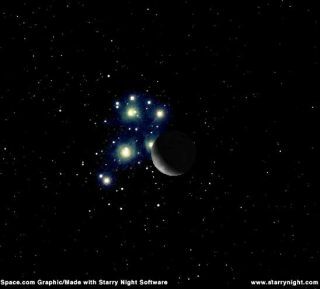 Indeed, on both occasions the Moon appears as a slender crescent phase as it traverses the Pleiades cluster. However, that April event occurred on a Saturday during convenient evening hours and when the prospective viewing audience was considerably larger. But in this upcoming case, observers will either have to stay up through the night (to await moonrise which will occur around 1:30 a.m. local daylight time) or set their alarm for the predawn morning hours. In addition, since the Moon will be a waning crescent, as opposed to a waxing crescent in April, stars will disappear first along the bright lunar crescent. They will reappear about an hour later in dramatic fashion: appearing to suddenly "pop-on" as if someone threw a switch. Unlike last April, when the Moon passed nearly centrally across the Pleiades, on this upcoming occasion the Moon will be passing somewhat off-center and will cover only the southern and eastern parts of the cluster and will completely miss the stars Electra, Taygeta and Maia. From Canada's Maritime Provinces and the Northeast States, advancing morning twilight will be an issue, since the eastern sky will be brightening as the Moon is moving off of the Pleiades. As a result, the reappearance of some stars may not be visible because the sky will be too bright. On the other hand, from the Central States, the occultation will already in be in progress as the Moon rises and may be at a rather low altitude as the last of the stars emerge into view. Therefore, a clear and unobstructed view toward the east-northeast is recommended. Unfortunately, as was the case last April, those who live from the Plains States and Prairie Provinces of Canada and all points west will miss out on the occultation, as the Moon will have already moved past the Pleiades by the time it rises for all of these regions. Nonetheless, the view in binoculars of the crescent Moon sitting just above and to the right of the star cluster will still make for a very pretty sight. Below are two timetables giving local circumstances for the disappearance and reappearance of the four brightest members of the Pleiades that will be occulted. The information is based in part from data generated by the International Occultation Timers Association (IOTA) and is valid for eight U.S. and two Canadian cities. Keep in mind, however, that many other stars not listed here will also be occulted. For more specific details concerning some 150 other North American cities, go here. Take note that if the disappearance or reappearance of a star occurs near or soon after the start of nautical twilight (roughly an hour before sunrise), it was assumed that the sky would probably be too bright to easily see it. In addition, the Moon might miss the star entirely. In both such cases, the time is omitted. All times are in local daylight time. Some stars will appear to come tantalizingly close to the Moon, but will not be hidden. In the most extreme case, a grazing occultation will take place: a star appears to wink on and off several times as it passes behind craters, mountains and valleys right along the Moon's edge. In order to see such a spectacle, however, you must be positioned along or within a mile of the graze path. According to David Dunham of IOTA, the most spectacular Pleiades graze this year will be of the brightest Pleiad, Alcyone (magnitude +2.9). At low altitude, the path starts in the Abilene, TX area and extends northeastward, with the Moon's altitude increasing, passing a little southeast of St. Louis. After Lafayette, it passes near South Bend, Indiana, then crosses lower Michigan (near Lansing and Saginaw), and then crosses the Bruce Peninsula in Ontario, where observers from the Toronto area will probably intercept it. Weather permitting, an expedition from the Washington, DC area, is tentatively planned, observing from sites along or near Indiana Highway 120 about a mile east of the north-south Indiana Highway 9 (9 and 120 intersect in Howe, Indiana) 2 miles south of I-90 (the Indiana Toll Rd. ).